And for the most part, that happened. 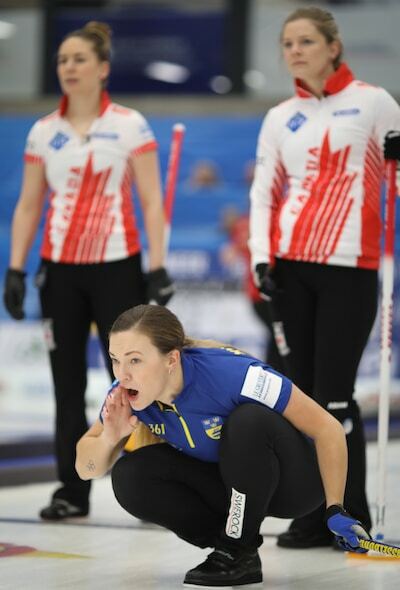 But two mistakes — one in the seventh and one in the eighth end — would prove costly as Canada’s Chelsea Carey bowed 5-3 to Sweden’s Anna Hasselborg at the 2019 LGT World Women’s Curling Championship, presented by Pioneer Hi-Bred. The loss left Carey, vice-skip Sarah Wilkes, second Dana Ferguson, lead Rachel Brown, alternate Jill Officer, team coach Dan Carey and national coach Elaine Dagg-Jackson with a 5-6 record — technically still alive for one of the six playoff positions, but needing an awful lot of help to advance. Canada would need to beat Denmark’s Madeleine Dupont (3-8) in its final round-robin game, at 2 p.m. (all times Eastern) on Friday, hope that Jamie Sinclair of the U.S. (6-5) loses her final round-robin game at 9 a.m. Friday against Switzerland’s Silvana Tirinzoni 7-3), hope that Japan’s Seina Nakajima (5-5) loses her final two games — at 9 a.m. against China’s Jie Mei (7-4) and at 2 p.m. against Hasselborg’s Swedes (10-1) — and that Germany’s Daniella Jentsch (4-6) wins her final two games, at 9 a.m. against Finland’s Oona Kauste (2-9) and at 2 p.m. against Switzerland. Then, Canada, Germany and the U.S. would finish with 6-6 records, tied for the sixth and final playoff spot, and with the teams all 1-1 head-to-head within that grouping, it would go to the Last Shot Draw distances, and Canada has a significant advantage over both the U.S. and Germany after Friday’s early draw. No tiebreaker games are played at the world championships. “We’ll go out there tonight and give it our darndest (against Denmark) and see if we get some help,” summed up coach Dan Carey. Canada was left in that position by two agonizingly narrow misses against the reigning Olympic champion Swedes, who’ve wrapped up first place in the 13-team round robin. 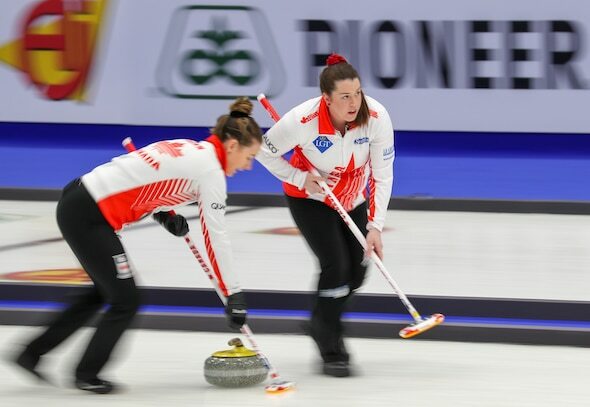 The Canadians had played a superb first six ends, cracking a deuce in the sixth after forcing Sweden to one in the fourth to open the scoring. But in the seventh, Ferguson’s hack-weight takeout barely rubbed on a guard and the Swedes converted that into a go-ahead deuce. An end later, Carey was attempting a hit-and-roll behind a stack of corner guards to set up a deuce. But the rock rolled a few centimetres too far and was second shot; Hasselborg drew to the rings to sit two and forced Carey to draw for the game-tying single. And in the ninth, Sweden manufactured the game-winning deuce to put Canada’s backs to the wall. Canada won’t be worrying about scenarios in its final round-robin game against the Danes.